Google’s slow, limited, browser-only, cloud-centric laptop platform is now the most powerful and capable user platform on the planet. Apple fans laugh at this idea, saying that a MacBook Pro can run the Chrome browser and gain all the benefits of a Chromebook, as well as all the benefits and leading-edge content-creation tools of a far more elegant, better designed and better engineered device. Windows users carp that Chromebooks are cute, but not serious business tools. The Surface Book 2 is also a tiny laptop, they say, but a real computer. Linux developers concede Chromebooks are interesting but argue they can’t be used for software development. But these obsolete stereotypes are not compatible with the new reality of Chromebooks. It’s time to clear up the top 10 myths that are no longer true about Chromebooks. 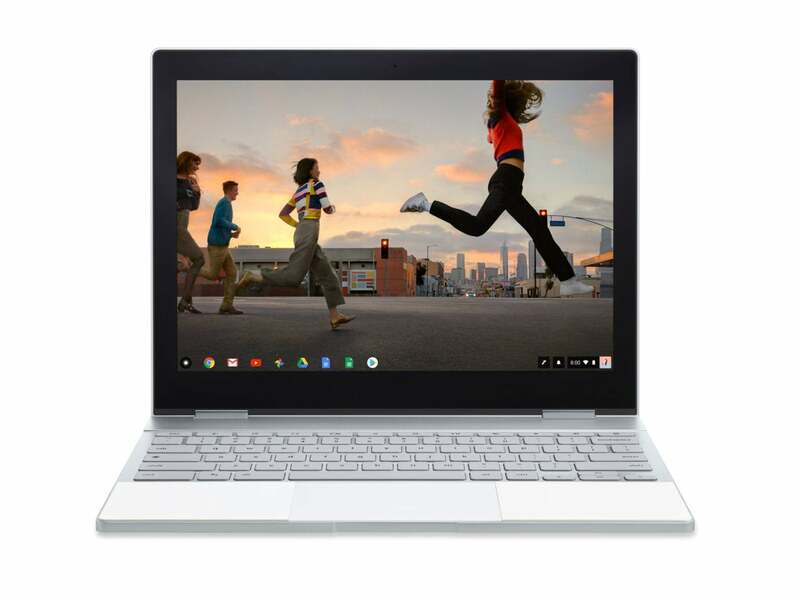 The original assumed vision of the Chromebook platform was a laptop and operating system capable of running only the Chrome web browser. You could do anything you wanted, as long as you wanted to stay on the web at all times. Today, the best new Chromebooks can runs apps from three additional operating systems. Not only do Chromebooks run apps, but they run more apps without dual- or multi-booting than any other computing platform. Chromebooks can run apps from Android, Linux and Windows concurrently in the same session. Multiple operating system support on Chromebooks is not about dual-booting. Apps from multiple operating systems run concurrently and side by side. Here I’m running Notepad++ for Windows on the left, an Android game called Orbit in the top right, and below that — why not? — Chrome. When I first saw the Android-on-Chrome-OS demo at Google I/O four years ago, I was pessimistic. But now that I’m running Android apps on my Pixelbook every day, I have to admit that I was wrong. The better Chromebooks run Android apps very well, and they run most of them. Chrome OS is also evolving rapidly into a closer-to-native Android device. Commits in the Chromium Gerrit reveal the forthcoming ability for the Files application in Chrome OS to reveal all the Android files that would normally be accessible to users on an Android phone. Android support alone makes Chromebooks one of the best platforms for apps, but that’s just the beginning. At the recent Google I/O, the company announced that it’s building a Chrome OS–specific virtual machine for Linux that will start fast and integrate completely. While today there is a range of approaches for running various flavors of Linux on a Chromebook, tomorrow Linux will run well and feel native. Windows apps are supported on Chromebooks via apps. 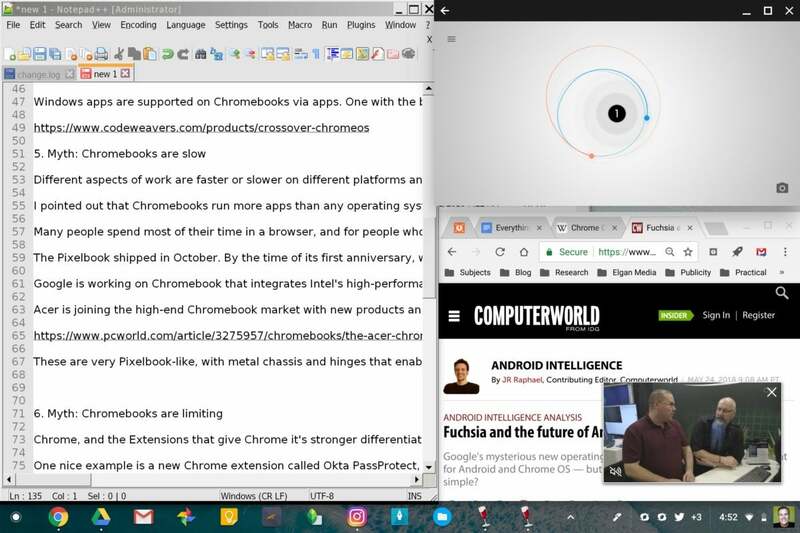 One with a good reputation is the beta version of CrossOver for Chrome OS. It’s not only free, but it currently offers free support as well. Different aspects of work are faster or slower on different platforms and devices, and these differences are magnified when you compare Chromebooks to macOS, Windows or Linux devices. I pointed out earlier that Chromebooks run more apps than any operating system ever. However, most of these run in some kind of emulation and aren’t going to be as fast as on their native platforms. Many people spend most of their time in a browser, and for people who use Chrome browsers, the experience of using Chrome is far faster on the new generation of Chromebooks. When I ran Chrome on my MacBook Pro, adding more tabs and extensions caused the entire laptop to slow to a crawl and the fan to spin loudly. Chrome on a MacBook used to crush my productivity. So my MacBook Pro is fast with apps but slow with serious Chrome use. The Pixelbook shipped in October. By the time of its first anniversary, we’ll see some very powerful alternatives from other companies. Google is working on a Chromebook that integrates Intel’s high-performance “Kaby Lake G” processors, which feature integrated Radeon graphics. Acer is joining the high-end Chromebook market with new products announced this week called the Chromebook 13, Chromebook Spin 13 and Chromebook Spin 15. Unlike Acer’s previous education-market Chromebooks, these are powered by eighth-generation Intel chipsets. They are very Pixelbook-like, with metal chassis and hinges that enable tablet mode. The 15-inch model is the first of that size to offer a Pixelbook-like rotating hinge. Many more are coming. And they’re very fast. The Chrome web browser — as well as the extensions that give Chrome its main advantage against other browsers — also features a radically underappreciated dimension: the nexus between data and application. One nice example is a new Chrome extension called Okta PassProtect, which checks your username and password against the “Have I Been Pwned?” database every time you log into any website. The database is a collection of credentials leaked online. The fact that the extension is built into the browser means security doesn’t rely on the user to remember anything. Every online application and site gets enhanced by a specific data source. Another example is a Chrome extension called Hunter from a company of the same name. It adds a button to Chrome that, when pressed, shows you a list of every email address ever used online using the same domain as the one you are currently browsing, making it easy to contact anyone at that company. The ability to add specific data sets to any website is monstrously powerful. Another underappreciated aspect of Chrome extensions is the ability to add features to cloud applications not intended or envisioned by the application maker. Services such as Google’s own Gmail are enhanced by hundreds of Chrome extensions, giving that email service new powers such as mail merge, integration between Gmail and Dropbox, or the to-do app Remember the Milk. Other extensions enter your user credentials for you, enable you to use a highlighter pen on the internet, block ads and a million other features. Chrome extensions are collectively so powerful that the end result is basically a second internet — a “super internet” that’s way better and more functional than the regular one. The only problem is that too using many extensions in Chrome bogs down that browser, making the “super internet” super slow on Windows and macOS. This problem is solved with a high-end Chromebook such as Google’s own Pixelbook, which lets you run dozens of Chrome extensions simultaneously without a noticeable performance hit. In other words, the “super internet” is available only to Chromebook users. Everyone else is locked out. Now that Chromebooks are getting far better and easier for running Linux, Google is explicitly promoting Chromebooks as a development platform. My personal favorite photo editor has long been Google’s Snapseed. The experience of running Snapseed for Android on a 13-inch touchscreen is far better than on the iPhone that I used to use. Other photographers prefer Polarr, Adobe Lightroom and others, which also run on the Chromebook via Android. A huge number of major cloud services, especially Google ones such as Docs and Gmail, offer easy offline modes. The Chrome Web Store is packed with free extensions that give you offline capability. 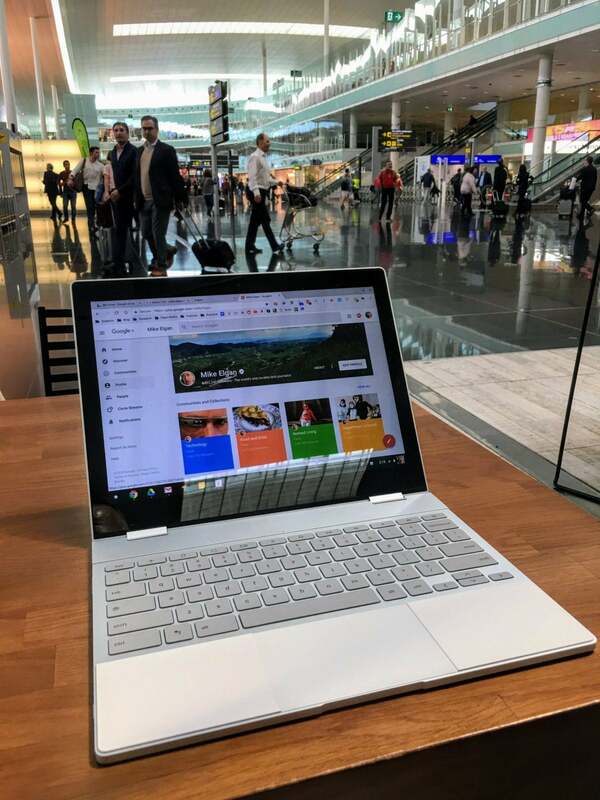 The Chromebook Pixelbook is the perfect travel laptop and is well-designed for running apps and doing work offline. My Pixelbook with 16GB of RAM and 512GB of storage, plus the pen, case and taxes, exceeded $2,000. Yes, some low-end Chromebooks are very cheap. But the powerful new generation is more comparable to a normal laptop. Chromebooks aren’t perfect and they’re not for everybody. As well-designed and well-made as the new Chromebooks are, they still don’t have the fit and finish of the MacBook Pro line. They’re not as capable as full-blown PCs at some tasks, especially processor- and graphics-intensive tasks. But the new generation of Chromebooks can run more apps than any platform in history. And they’re still the most secure computing platform ever. My advice is to choose the computing platform that suits you best. But base your choice on the new facts, not the old myths.